M6F How to Bless Others Because God is El Shaddai | GOD Who Are You? AND Who Am I? HOW ARE WE TO BLESS OTHERS? How are we to bless others according to the Old Testament? There are so many ways to bless others, most of which will be discussed in Chapters 16 and 17, when we take the responsibility of being salt. Our purposes here are to address how we can fulfill the Great Commission to reach our world for Jesus Christ in giving of our resources, whether small or large. Have you ever spent one day without having to spend money for something? Our ancestors may have lived off the land and were able to do this, but it is unrealistic in today’s society. Money drives our world; therefore, what we do with our own money defines our life and reveals who we are. God gives us wisdom in how to order our world aright by establishing the tithe. When we follow God’s way of giving, the nine-tenths left is blessed because He will rebuke satan from it—the devourer of appliances, cars, money, and possessions. He causes it to s-t-re-t-c-h when we give the tenth off the top to Him. The Bible tells us not to put God to a foolish test (see Deut. 6:16; Matt. 4:7). This is the only time God asks us to test him—to see for ourselves if He will not open the windows of heaven and pour out blessings until they overflow! He tells us to try it and see what He will do! This is not a foolish test. The best definition of the tithe is the first fruits of all thy income (see Ex. 23:16, 19). The first fruits were to be brought to the house of the Lord, in other words, off the top, the first check written, not from what is left over. If you have had a garden, especially tomato plants, you know the first ripe tomatoes are the very best, the only unblemished ones worthy to give to God. God has placed in our care and keeping everything we have. Only if we are faithful with what we have, will the Lord bless us with more. Jesus tells a story about a man going on a journey who entrusted his property to his servants. To one he gave five talents of money, to another two talents, and to the other, one talent, “each according to his ability” (Matt. 25:15). The master told the man who hid his talent, “You wicked, lazy servant! So you knew that I harvest where I have not sown and gather where I have not scattered seed? Well then, you should have put my money on deposit with the bankers, so that when I returned I would have received it back with interest. “Take the talent from him and give it to the one who has the ten talents. For everyone who has will be given more, and he will have an abundance” (Matt.25:28-29). The faithful will see increase. Rob Leacock was a financial controller at Capital Christian Center in Sacramento, California. He counseled many people regarding their money situations. Even though he gave them sound Biblical teaching, most of them did not change their lifestyles. Only those who integrated financial planning with a lifestyle of total discipleship [as a condition of their heart relationship with the Lord] realized improvement in their finances. Leacock says, “Believers who connect prayer and Bible study with the use of their finances save more money, get out of debt and give and serve more in their local church.” Denise and Joe are good examples of a couple who did this. 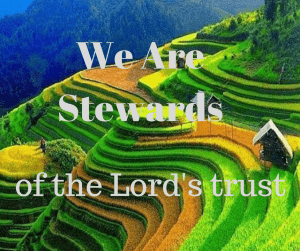 They learned stewardship through their relationship with the Lord. Without that relationship, they would not have seen any real blessings and believe they would have been bankrupt a second time. They learned to tithe. Many months it was especially tough to do, but they were obedient. Giving is an act of the will. Giving demonstrates our belief God alone owns it all, and that God alone is our only source of supply. How are we to bless others according to the New Testament? “For with the measure you use, it will be measured to you.” Without abolishing the tithe, Jesus gives a higher principle. The apostle Paul says it another way, “Remember this: Whoever sows sparingly will also reap sparingly, and whoever sows generously will also reap generously. Each man should give what he has decided in his heart to give, not reluctantly or under compulsion, for God loves a cheerful giver” (2 Cor. 9:6-7). Giving is like sowing seeds that grow, producing more seed from which to give. “Now he who supplies seed to the sower and bread for food will also supply and increase your store of seed and will enlarge the harvest of our righteousness. You will be made rich in every way so that you can be generous on every occasion, and . . . your generosity will result in thanksgiving to God” (2 Cor. 9:10-11). A youth group in Arkansas learned that sowing seeds of forgiveness returned in good measure. They worked and saved for two years to go on a mission trip to Cambodia. When the youth director attempted to check with the travel agency to confirm the tickets, worth $30,000, he discovered the mother and son team were gone. They had taken money from customers for six months after filing bankruptcy and skipped the country. Donations came flooding in—one for $5,000 and another for the full $30,000! Their church turned money away. The biggest lesson the youths learned that summer was that when they gave back to God in obedience to forgive without judging, He returned—pressed down, shaken together and running over. No one can eventually steal from a child of God who knows how to give and forgive. It has been said that when we do not forgive, waiting for an apology, we are forselling. We are not giving anything. Merriam-Webster’s Collegiate Dictionary, p. 1344. Rob Leacock, “Using Money God’s Way,” Pentecostal Evangel, No. 4580, February 17, 2002, p. 20. Quote from Pastor John Hagee.